I love a good gingerbread. And not just at Christmas. To me, it’s cake. That’s why I bake my gingerbread in a round cake pan—IMO, square pans are for brownies and bar cookies. After a recent visit down South—West Tennessee, to be exact—I was inspired to make a gingerbread with sorghum and buttermilk, two ingredients associated with traditional southern baking. The result? 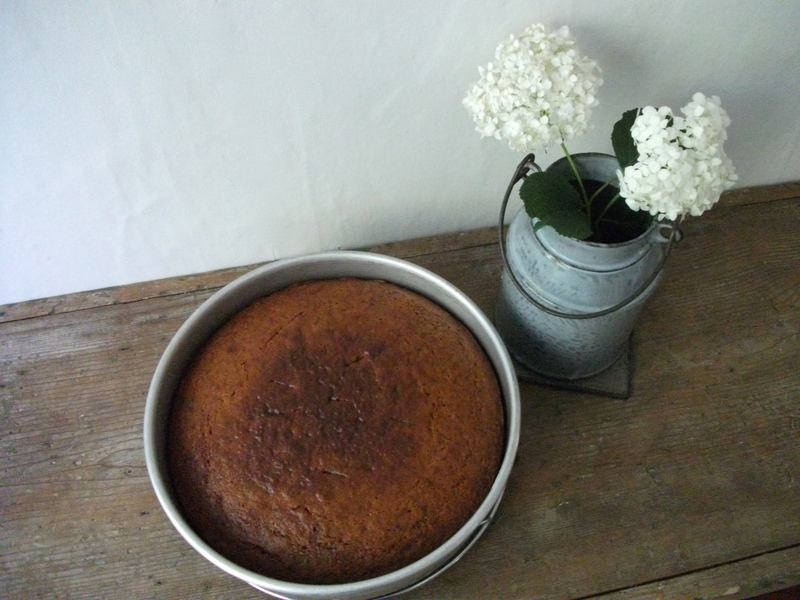 A moist, ginger-nuanced, fresh-tasting cake that is frankly irresistible. If you have a hankering for cake—one with a sliver of redemptive value—this is the one to bake. After all, sweet sorghum, buttermilk and ginger root are all healthful in their own right. Sweet sorghum, of which Tennessee is a leading producer, is extracted from a grass related to sugar cane. Pure sweet sorghum syrup has no added sugars, no artificial ingredients and no preservatives. It’s a nutrient-dense sweetener. A good source of minerals and B vitamins, sweet sorghum, per 1 tablespoon serving, contains: potassium (200mg), calcium (30mg), magnesium (20mg), phosphorus (11mg), zinc (.80mg) and iron (.76mg) . Despite its misleading name, buttermilk does not contain butter. And, contrary to popular perception, it is relatively low in fat. Like yogurt, buttermilk is a fermented milk product and considered a probiotic. High in calcium (285 mg or 350 mg per 1 cup serving, depending on whether it is made from “low-fat” (1%) or “reduced fat” (2%) milk), buttermilk is also an excellent source of potassium, riboflavin and Vitamin B12; a good source of B vitamins, as well as protein (8-9 mg per 1 cup). When it comes to milk or any milk product, however, it’s best to buy organic. Better flavor. Better for you. Personally, we like Organic Valley’s cultured low-fat buttermilk. In my gingerbread, I use fresh ginger root, right, finely minced in a food processor. Ginger’s attributes are considerable. 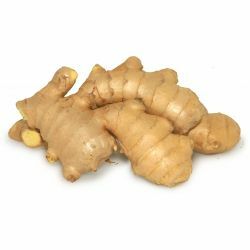 Considered a “warming” herb in Asian medicine, ginger has been used to stimulate blood circulation; help cleanse the body; stimulate the appetite, and quell nausea and motion sickness. Raw ginger contains shagoal, a ginger compound that can kill cold viruses, and has been used as a remedy for colds and the flu. Because ginger also contains gingerols, anti-inflammatory compounds, it has been used as a pain-reliever and to treat arthritis. In terms of flavor, fresh ginger is superior. Ground ginger lacks punch. Especially if it’s been sitting on your spice rack for eons. Or languishing in your cupboard. With ground ginger, any spicy edge it has will fade over time. Fresh young ginger root, on the other hand, tastes alive, adding sharp, zesty bite. I’ve adapted this old-fashioned Smith family recipe (my husband hails from a food-loving Smith clan on his mother’s side) to ramp up the ginger flavor. And, yes, I used mostly local, all-natural or organic ingredients, including the fats—equal parts organic Spectrum vegetable shortening and all-natural Cabot unsalted butter, made by a Vermont-based dairy farm cooperative. A worthy splurge. Taste- and quality-wise, it makes a big difference. When my husband offered samples of my sorghum gingerbread at a local pub during a game….? Gone! When he shared it at the office with his European colleagues, high-minded foodies….? Gone! When we even took this gingerbread to a friend’s barbecue….? Gone! Preheat oven to 350 degrees. Generously butter a 9” round cake pan (NOT non-stick). In a medium bowl, measure out 2 level cups of all-purpose flour. Sift. Then, measure out two cups of sifted flour (you will have flour left over). Add kosher salt. Whisk well. Set aside. Place shortening, softened butter and sorghum syrup in a two-quart saucepan. Cook slowly over medium-low heat, whisking frequently to blend well. When the mixture begins to boil, remove from the heat. Whisk well: sorghum and butter should be well blended. Transfer hot mixture to a large stainless steel mixing bowl. Using an electric mixer, set on high speed, vigorously beat the baking soda into the sorghum-shortening-butter mixture. It will foam. On medium speed, beat in each of the following ingredients—separately–until well combined: the buttermilk; the beaten egg; and the minced ginger. Using the mixer briefly, blend in the sifted flour and salt, about 30 seconds. Switch to large spatula and fold in the dry ingredients until just blended. Do not over mix. Pour batter into a well-buttered 9-inch cake pan. Bake on the center rack for 15-17 minutes. (Be careful not to over-brown cake too quickly. Your oven may run hotter or cooler than mine, so keep a close eye on your gingerbread after 15 minutes). Then, transfer cake to rack set on the lower third of the oven. Bake another 5 minutes, or until a knife inserted in the center comes out clean. This entry was posted in Food, Health, Home Baking, Travel, Wellness and tagged buttermilk, Cabot butter, ginger, gingerbread, sorghum syrup, Tennessee. Bookmark the permalink. Thank you, Cathy!! You’re so welcome…and enjoy…!! And we’ll definitely visit our next trip down….would love to see you all…!